Inaugural Issue of The Raven’s Quill By Claire Workman Welcome to the inaugural issue of the Raven’s Quill! Every day, the students at the Summit are imagining, creating, and writing. These students put conscientious and deliberate effort into their work and each piece represents their growth in skill and understanding. Most often, the only people who get to see the students’ work and development are their teachers and parents. This is what inspired the Raven’s Quill, a publication aimed at sharing what our students accomplish in the classroom with the broader community. initial Quill publication marks the start of the high school’s journalism program. In starting a journalism program, the logical assumption would be to create a newspaper, but a newspaper implies covering solely the news, and we wanted to do more than that. We decided to create an opportunity not just for high schoolers to write but for any student to write, draw, build, or create and be able to share that work. We plan on continuing to publish what the Summit students create periodically throughout the school year. 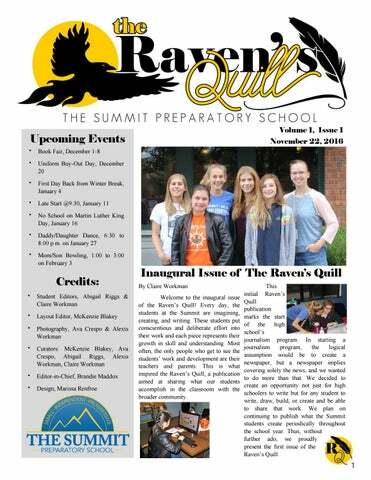 Thus, without further ado, we proudly present the first issue of the Raven’s Quill. The pre-k students share their work and bright smiles. The students have been learning about the alphabet and letter sounds. Story With Illustrations By Jasper K., Kindergartener Once upon a time I went to Alex’s house. We went to Alex’s room. It was fun. We went to Alex’s basement. We watched Ninja Turtles and then we had fun. The End! 1st and 2nd Grade In the first grade class, Mrs. Heet taught her students about renewable and nonrenewable resources. As the students learned about different resources, they created representations of the materials. Each student drew a renewable and nonrenewable source, ranging from diamonds, coal, and silver to sunlight, wind and water. By Anna S., 2nd Grader By Mason M., 2nd Grader First off, I would like to tell you that one year on Pluto is 248 years on Earth. That’s a lot! I bet you’re wanting to know where Pluto got it’s name. Well, in fact, the girl who named Pluto was not much older than us! Her name was Venetia Phair, she was only eleven. Pluto is the only planet that was named by a kid. Despite many theories Pluto is not actually a planet because it is not the dominant rock in its orbit, and that’s why in August 2006 Pluto was declared a dwarf planet. Mars is sometimes called the red planet because the dirt is red. The dirt is red because of the iron oxide. Did you know that Mars means the Roman god of war? It has two moons ( Phobos and Deimos). Did you know that one of Mars's moons (Phobos), is twice as big as Mount Everest? Water used to flow on its surface. One day in the future we may live on Mars. Bubblegum By Chloe S., 5th Grader I learned how to blow a bubble a few months ago, and I love blowing bubbles now! Though I have had a bad experience with gum before, once in third grade I was chewing gum and it got in my hair! It was terrible and it seemed like a total coincidence because it was Crazy Hair Day! I bet you know Marilyn Monroe and her movies, but, do you know the girl behind the camera? Marilyn’s real name is Norma Jeane Mortenson but, when baptized her name changed to Norma Jeane Baker. Most of Marilyn’s childhood was spent in foster homes and orphanages. Marilyn had 11 sets of foster parents. Marilyn Monroe went to college at University of California, Los Angeles. Mrs. Monroe hated her movie Dumb Blondes because everyone thought she was dumb, but in fact she was very smart. How to Blow a Bubble By Blakely T., 5th Grader The first thing I do is chew the gum until it’s soft, it will take a long time and a lot of chewing. After that I press it on the roof of my mouth. I then flatten it just so it’s a square with my tongue. Then put your tongue through the gum about 45%, and pin the gum on the middle of your tongue with your teeth. Now blow softly, you can make a buzzing noise too. Middle School European Starling By Essie H., 6th Grader Invasive species such as the European starling are taking over the U.S, driving native birds out like the American robin and the finch. Robins are native and compete against the starling for food and territory. Like starlings, robins are scavengers, but they are not aggressive. Finches are small songbirds and make their homes in small places, which are good places to hatch chicks. The sly starling can fit in their homes and drive them out. The starling is a bad species, and we, along with some other scientists, should work together to drive them out. They have driven out so many native birds, so let’s help the ones that remain. Let’s help our native birds. Enactus By Jacob W., 8th Grader What is Enactus? Enactus stands for “ENtrepreneurial ACTion to make the world a better place for US all.” The organization’s goal is to empower students to take action and create projects to make the world a better place in which everyone can live. Student projects can range from recycling mattresses to giving homeless people jobs, preventing tons of waste or creating an indoor farming solution for people in the most desolate places in Canada. Enactus organizes an annual event called the Enactus World Cup. This event can take place in any country that the company has a foothold in; it was most recently held in Toronto, Canada. The Enactus World Cup is a competition in which the aforementioned student teams show projects that they have created throughout the year to a panel of judges. The winners take home the Enactus World Cup, and receive some funds to continue their project to fruition. However, this does not mean that the losing teams stop their projects. The point of the competition is to create sustainable projects that make the world a better place. Through student projects and the Enactus World Cup, the organization strives to make the world a better place. Mrs. Anderson does for her students and colleagues, she is a vital part of the Summit community, and we wouldn’t be the same without her. Next time you happen to see Mrs. Anderson, feel free to thank her for all that she’s done for the Summit! 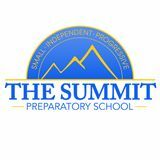 The Summit Preparatory School's student led school newsletter. Created, designed, and written by Summit students.